The In Love with the West show will be on display at Studios on the Park in Paso Robles through Feb. 25. Visit studiosonthepark.org for more information. Growing up, Cindy Long could tell what day of the week it was by which Western TV show was airing that night. Gunsmoke in particular was a family favorite that she watched with her dad. "I've always had a fascination with the West," Long said. "I grew up with those shows and always romanticized life in the West." ROUND 'EM UP From competing at the rodeo in his youth to helping out with friends' horses now, Utah artist Don Weller seeks to show joy in pieces like Comes in Swingin'. While Long's pull toward the West was temporarily put aside, the now North Carolina-based artist returned to it about the same time she rekindled her love of drawing, roughly 14 years ago. Long's work, along with other artists from around the country, is currently on display at Studios on the Park in Paso Robles as part of the In Love with the West show. Artist and guest curator Don Weller said that for this show he looked specifically for other artists who either lived the Western lifestyle or were close observers of it. "People don't realize that cowboys are still out West doing what they've been doing for centuries," Weller, who is based in Utah, said. "You don't see them, they're up over the hill." Long wouldn't call herself a cowgirl, but she is deeply drawn to the stories of people who do. "I don't live it, but I'm close to it," Long said. The first thing you'll notice about Long's intricate graphite pencil drawing portraits is the faces. 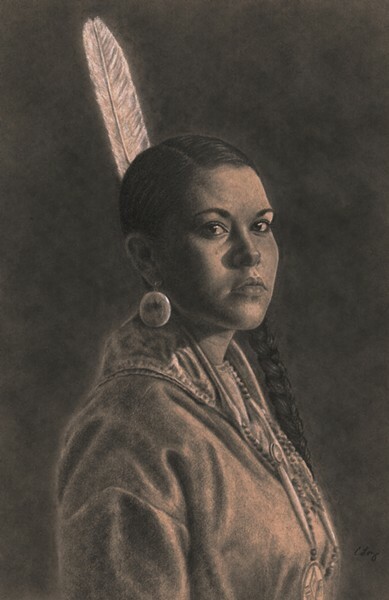 All of her pieces—like Utia Chee, a stunning depiction of a somber, serious looking Native American woman—focus on the soulful, distant eyes or chipper little smile of her models, most of whom are cowboys and Native Americans, carrying on the values of the Western lifestyle even today. "People who live and work the Western lifestyle are unique people," Long said. "They have to love what they do. I hope that people look at my artwork and not just see a portrait of a person, but that they take away a feeling and maybe they want to know a little more about that person or maybe they create a story in their minds." TRUE TO LIFE Whenever possible, North Carolina artist Cindy Long prefers to use models in her pieces, like Utia Chee, who really live and embody the Western lifestyle. 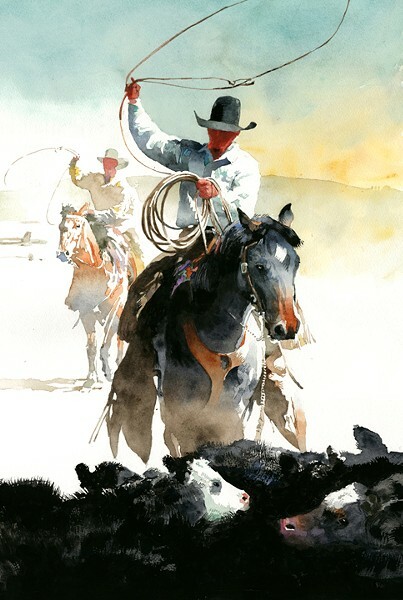 While faces and their features are dominant in Long's work, they're noticeably absent from Weller's vibrant watercolor pieces, like Comes in Swingin', that often show cowboys hard at work, roping cattle or riding horses. The Utah artist is intentional with this choice. "I like enough detail that the people who were there will recognize the way people were dressed or the markings on a horse. I want to see the brush strokes. If I wanted a lot of detail, I'd take a photo." Once upon a time, Weller thought he'd be a cowboy like his subjects. In college he roped horses and calves competitively at rodeos, but he wasn't quiet fast enough to make a living at it. Now Weller has his own horses and helps out at friends' ranches from time to time, lending a hand or taking photos to work from in the studio where he paints. "In a way it's a kind of study of humans and horses working together," Weller said of his work. While the physical demands on a cowboy or ranch hand make for a tough life, Weller hopes viewers will take away a sense of lightness from the In Love with the West show as well. Arts Editor Ryah Cooley is out on the range at rcooley@newtimesslo.com.